Unfortunately this morning I had to miss my normal Friday morning ride, but I have got a good excuse. This morning I went into the Red Cross Blood Bank in Sydney to donate plasma. This is the 5th time I have donated plasma, and it won’t be the last. 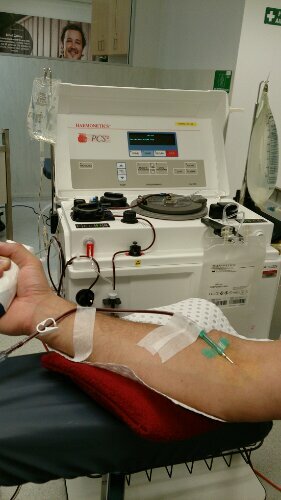 It is a strange sensation when you donate because they take all the blood out through a apheresis machine, strip out the plasma and return the red blood cells. The returning cells give you a cool sensation in your arm. Here is me strapped up about ready to go. It turns out that my blood type is one of the rarer types in Australia – B+ with less than 8% of the population having this type. I was surprised by some of the other statistics; only 1 in 30 donate, but 1 in 3 people will require blood in their lifetime. I was one of the latter in my younger life, so a year ago I thought it would be good to join the “elite” group. I know that needles and cyclists have been a bit of a taboo in recent years, but I would encourage anyone who is eligible to donate to do so. It really doesn’t hurt, and they give you a free milkshake after. The staff at the Blood Bank are always pretty cool, and it’s good to be around people who enjoy their jobs. But the biggest satisfaction I get from this is that part of me is helping someone else get better, maybe even saving their life. Will I ever know who I am helping? Probably not. But that is what is cool about it. Anyways, back on the bike tomorrow, but at a slightly slower pace. And no, donating does not improve my performance on wheels – haha! GOOOOD ON YOU . . ! It looks like blood doping to me Chris. Congratulations! Did you get a cookie and glass of orange juice afterwards? They usually give that to people here in the United States after they donate blood. Got a cookie as well (got three actually, but don’t tell the other donors). I always choose a milkshake instead of juice. It turns out that most people with a blood type B (+ve or -ve) should have a high affinity for dairy. Good on you! I imagine the recipient will be grateful, particularly as we have no monetary reimbursement for this altruistic gift of blood. I am one of the negative blood groups so also used to give blood regularly, but my iron levels are a bit too low these days. Mind you, I used to give whole blood, never had the red cells returned, so that was interesting to read.